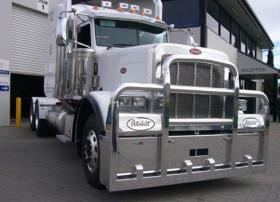 Peterbilt FUPS hi-tensile polished aluminium bullbar 5 Post design for maximum protection. 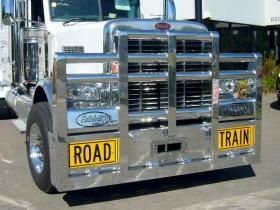 Reversable Aluminium Road Train Signs, Cow Catcher plus 4 Small Uprights. Chrome Plate over Tow Hitch and 100 diameter Pipe. Driving light mounts to suit application. Custom "Peterbilt" inserts. 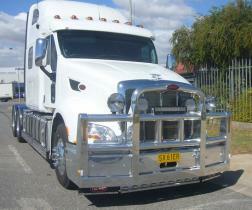 Peterbilt FUPS Custom Built hi-tensile aluminium bullbar, lower cow catcher bar with mini uprights, driving light mounts plus centre light-bar mount to suit light bar. Tow pin mounted in heavy duty steel backing plate. Indicator repeater fitted to external uprights. provision for marker lights on lower plate. Provision for front mudflap. 100mm diameter heavy duty 6mm wall pipe. 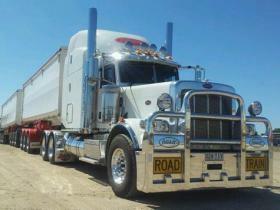 Reversable Road Train signs, optional. 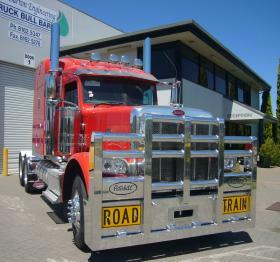 Peterbilt FUPS Custom Built hi-tensile aluminium bullbar, lower cow catcher bar with mini uprights, driving light mounts plus centre light-bar mount to suit light bar. Tow pin mounted in heavy duty steel backing plate. Indicator repeater fitted to external uprights. provision for marker lights on lower plate. Provision for front mudflap. 100mm diameter heavy duty 6mm wall pipe. Custom "Peterbilt" inserts. Reversable Road Train signs, optional.